Did you know that you can use a reverse mortgage for purchase of a new home? It’s true. It is very popular for seniors to use reverse mortgages to transform equity in their homes into cash without burdening themselves with monthly payments or risking foreclosure. However, it is less known that in 2008, the US Federal Housing Administration enacted legislation in response to the housing market crash allowing seniors to use a reverse mortgage to purchase a home. Not everyone qualifies for a Home Equity Conversion Mortgage (HECM) for Purchase transaction. But if you do, you can use a reverse mortgage to buy your dream home and escape the need for the burdensome monthly payments associated with a normal mortgage. How Does the Reverse Mortgage / HECM for Purchase Program Work? Normally, a reverse mortgage is used to convert the equity in your home into cash. One of the primary uses of a reverse mortgage is to pay off a mortgage or other property lien and therefore eliminate all payments associated with your home. By using a reverse mortgage to purchase a property instead of on a property you already own, you can bypass the need to ever have a forward mortgage. If you have an adequate down payment, you can buy your dream home without any monthly payments at all. 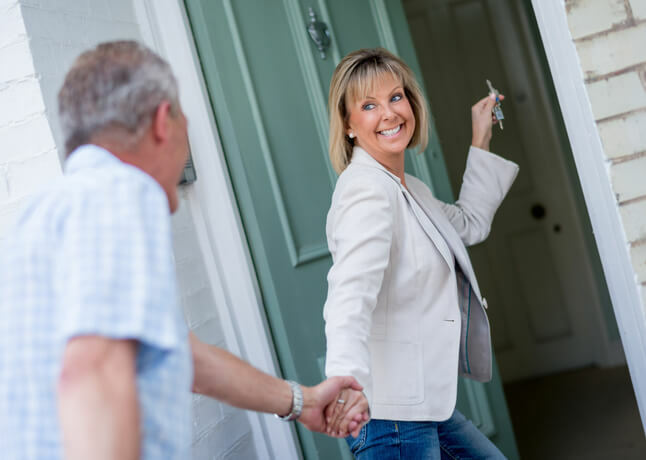 If you qualify for enough money to permit you to purchase the property, you can then do so, and live in the home for as long as you wish, as you would with a normal reverse mortgage. The fees, interest rates, terms, and conditions of the loan are all identical to those of a normal reverse mortgage, meaning that you never have to make any payments for so long as you are living in the property. None of the money you borrow with the reverse mortgage has to be paid back until you (or your spouse) are no longer living in the property. However, it is important to note that the home must be maintained and all taxes and insurance must be paid for the duration of the reverse mortgage. The home purchased with the aid of a reverse mortgage must become your primary residence. Downsizing – selling your existing home and buying a smaller, less expensive home – can be a great way for seniors to best leverage their home equity to fund as well as reduce retirement expenses. Downsizing can also provide quality of life benefits. If you choose to use a HECM for Purchase when you downsize, you can eliminate all monthly mortgage expenses. Homeowners who are interested in downsizing can often generate enough money from the sale of their property to easily pay the larger down payment required for a HECM for Purchase transaction as well as for the ancillary costs of moving. If you plan to downsize your existing property, then a reverse mortgage for purchase program can allow you to leverage the money you will get from your old property as a way of ensuring you will not have to make monthly mortgage payments in your new home. What are the Drawbacks of Using a Reverse Mortgage to Purchase a Home? The major drawback of purchasing a home using a HECM reverse mortgage is that it requires a large down payment. The down payment must be sufficient to meet the loan to value ratio required for a reverse mortgage. And – as with a regular reverse mortgage – you may not have any other loans against your home, meaning that you cannot get a second mortgage or other types of home equity loan to help you pay the costs of purchasing the home. Depending on your age and the value of your property, you may need to bring as much as half of the home’s value to the table yourself in order to purchase the home. Besides the qualification concerns, the other drawbacks normally associated with a Reverse Mortgage still apply to the HECM for Purchase programs, such as the potential for adverse effects on your estate, or the risk that it will affect needs-based programs such as Medicaid. And, in general, it is not recommended to get an HECM Reverse Mortgage, whether on a home you already own or a new property, unless you intend to remain in the new home for at least five years. As always, you should discuss the Reverse Mortgage with your family and heirs prior to making a decision on whether or not to proceed. Which Property Types Qualify for the HECM for Purchase Program? Properties constructed less than one year before the purchase date. When the tool asks for the home’s value, put the purchase price. The loan amount shown is roughly how much you will be able to borrow. The difference (purchase price – loan amount) is how much you will need for the down payment.